It was half past six in the evening and we had just returned from a walk when we decided to have a last look at the back garden. Passing the plum tree we could see some bee activity where the Andrena flavipes is nesting. I was wondering if she would come back! 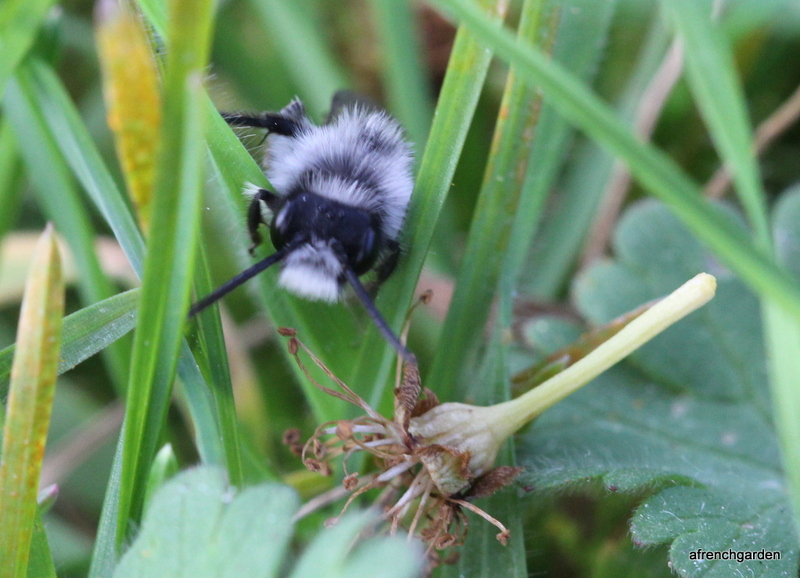 I’ve already posted about Andrena cineraria in my post It’s in black and white and I took those pictures in the middle of April last year. 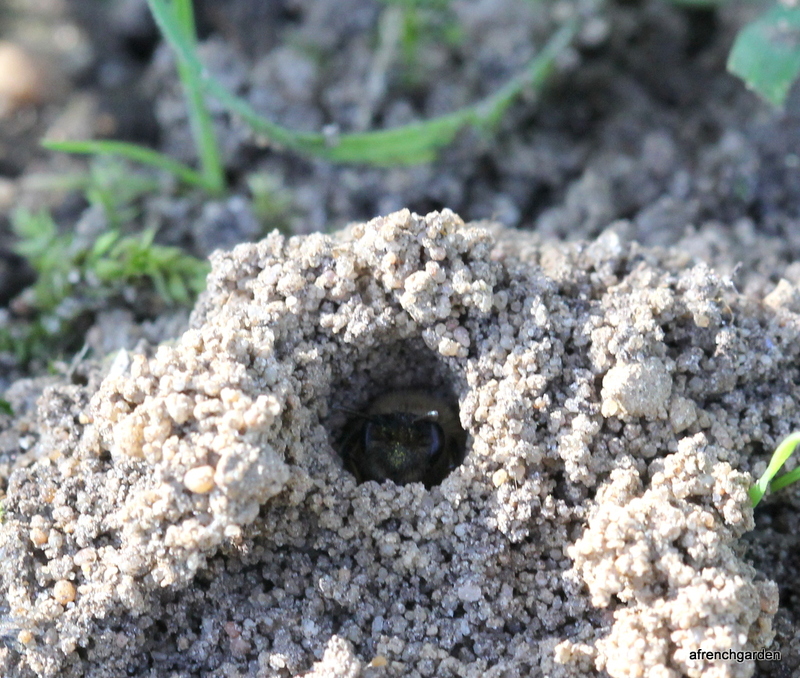 I saw several flying low around the grass and one quickly popped down a hole and once inside closed it over by moving the crumbly soil from the sides of the pile over the entrance. A bit like closing the bedroom curtains in the evening. I followed one patiently who seemed to be having difficulty finding the hole. Now it becomes clearer. 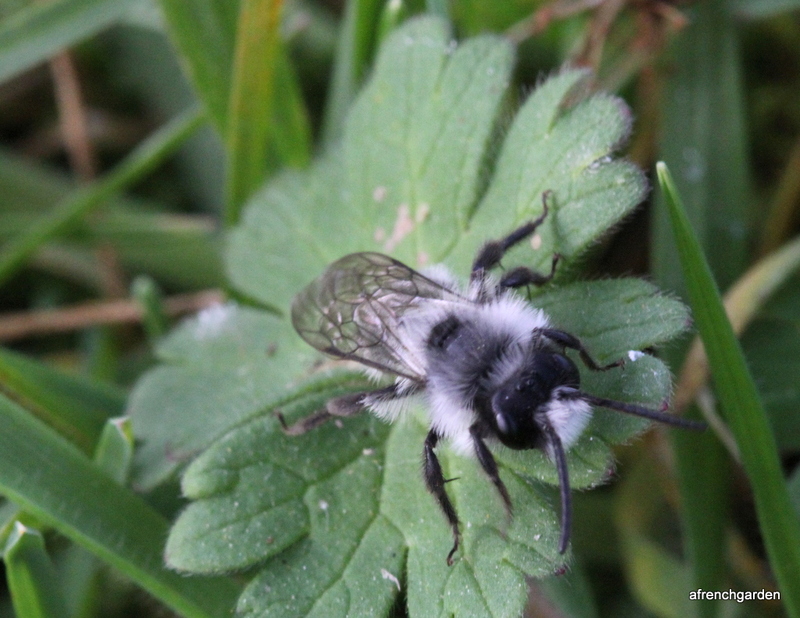 This is the male Andrena cineraria. He was still on the search for an unmated female. The female only mates once and then becomes unreceptive and goes about nest building and egg laying. 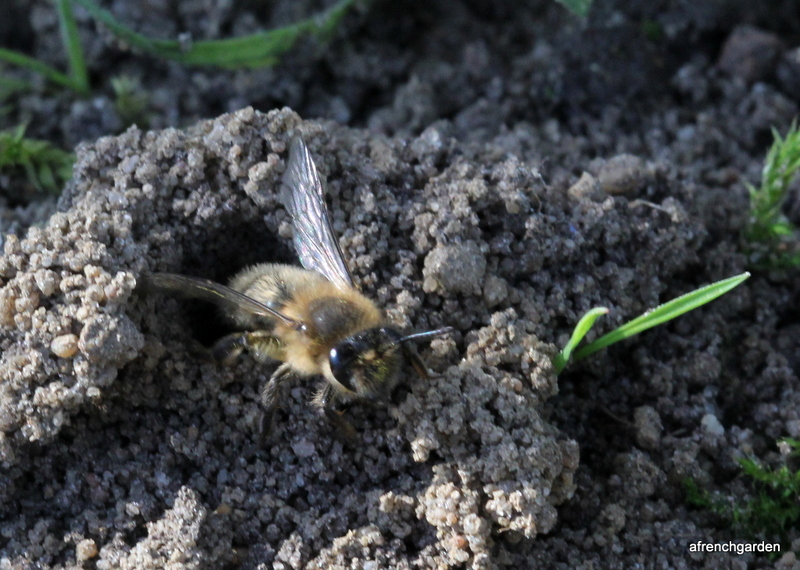 The male’s function is to find a female and mate, not for him the task of burrowing tunnels. This side shot shows up the difference between the male and the female. The male is only very slightly smaller than the female but has more white hair. There are white hairs present on his thorax and tufts of white hair at the top of his femurs. He has larger tuft of white hair on his head than the female. 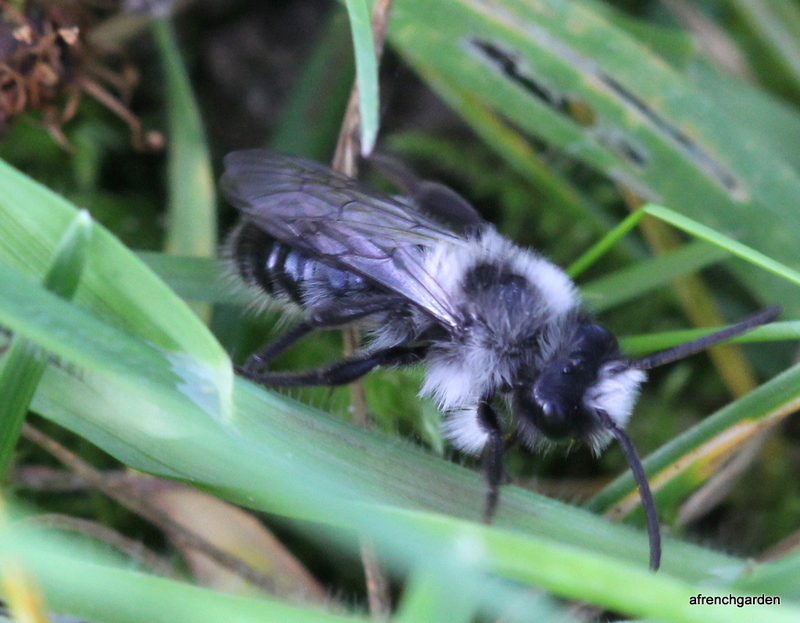 This is the first time I have seen the Andrena cineraria male. I thought the female was beautiful but I think he might be even cuter. I saw this wild bee nest yesterday and posted it in A French Garden but it may suit this blog better. 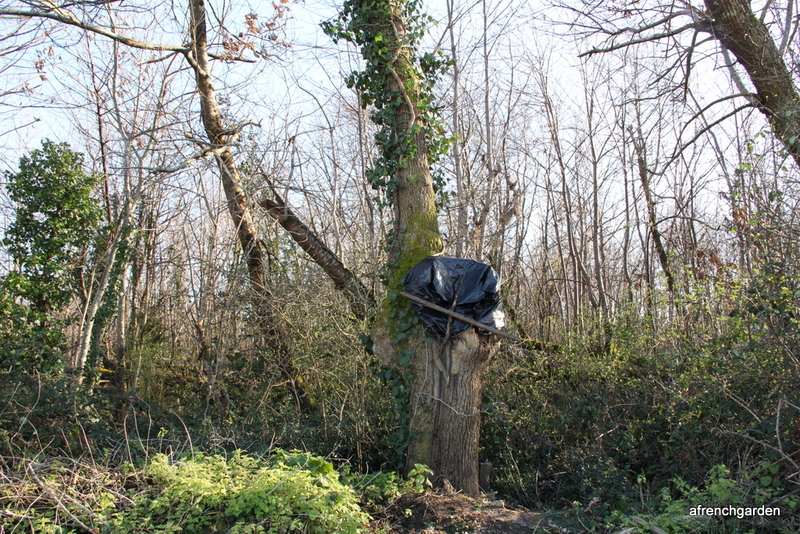 I’m not sure whether it is technically correct to call this a wild bee nest. It is definitely bees living in the wild. Should I call them wild bees or feral bees or even run-away bees (having left their bee keeper never to return), I’m not sure. Anyway, I have always harboured a desire to see bees doing their own thing as nature intended but I never expected to see it in real life. But that was before I was talking about bees to our friend Manuel. I was determined to photograph them and spent quite a bit of time on warmer days crouching under the plum tree watching them. I did not have a Macro lens then so the photographs were not detailed. However, it is very pleasant under the plum tree when it is in full flower with the sun shining and the bitter almond perfume of the flowers drifting around you. 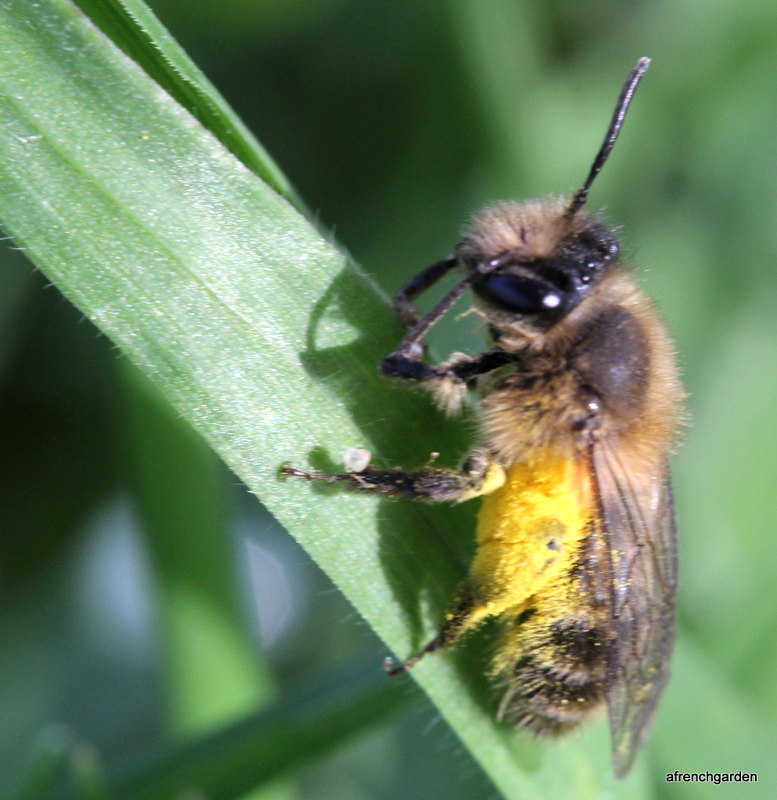 I was not able to identify the bees last year, I could not even be sure what genera they belonged to – but I was hooked and I knew where to look for them this year when I was going to be more prepared to identify them. The weather has been so mild (but very rainy) that when I looked on the first sunny day for ages, on the 23 February, I was surprised to see that the nests had started to appear. The next day I saw my first bee emerge. Yes, it was the same bee. 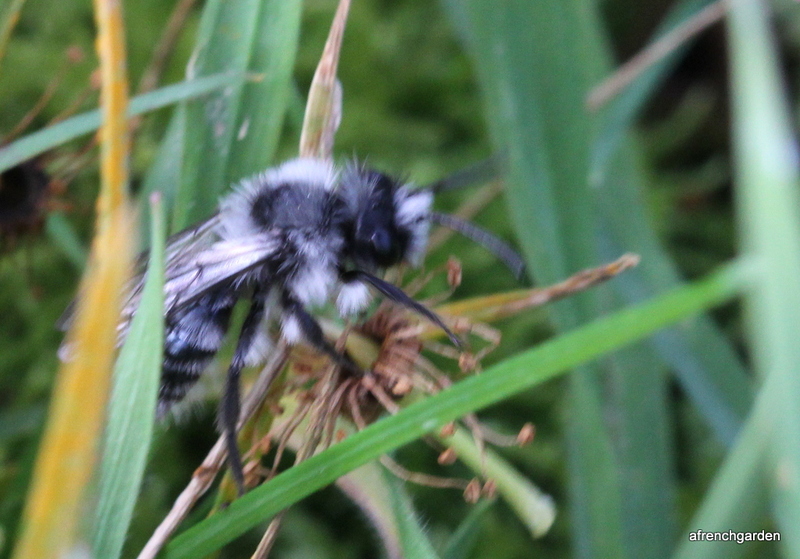 She left the nest too quickly to get a really good photograph but it was much better than last year – and I was very pleased to see the bees had survived in the sodden ground. 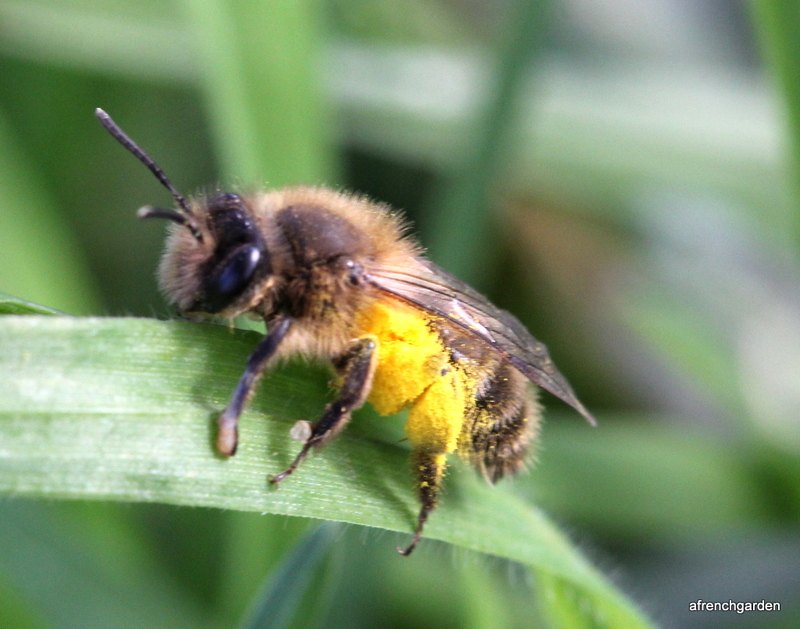 Mining bees usually prefer dry, soft soil. 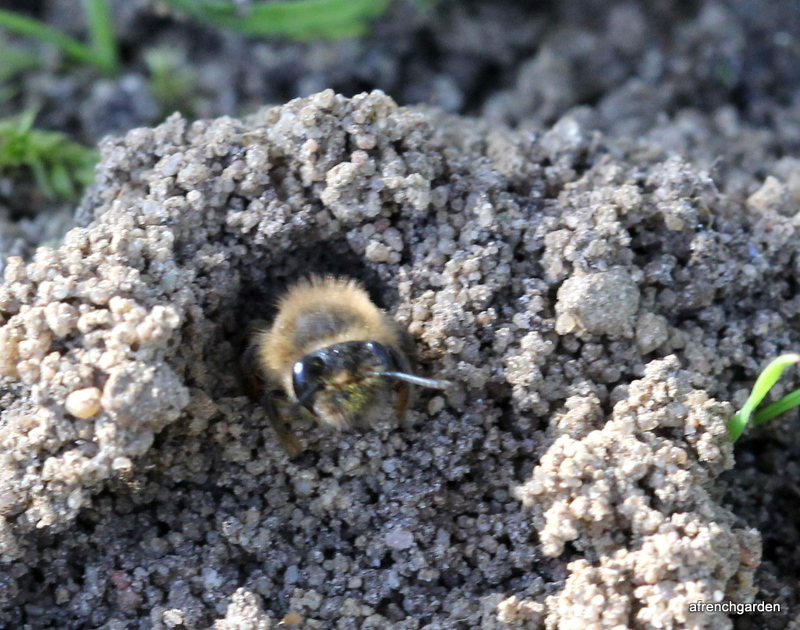 Some like sandy sites or chalky soil or nice sunny banks to nest in. The soil under my plum tree would never usually be very wet as my garden soil drains rapidly, probably as the region is based on limestone rock. This year we have had unprecedented rain and many areas have flooded – happily not under my plum tree! Two days later I was able to get some pictures from above that gave me a clear image of her fore wings. The wings have three sub marginal cells and the lower border of the third one is longer than the middle one (sorry the red lines are very fine) In addition, the basal vein meets the longitudinal vein at an acute angle (see better red arrow). Also, the vein pattern is the same as a photograph of Andrena flavipes in “Bees of Surrey” by David W. Baldock. 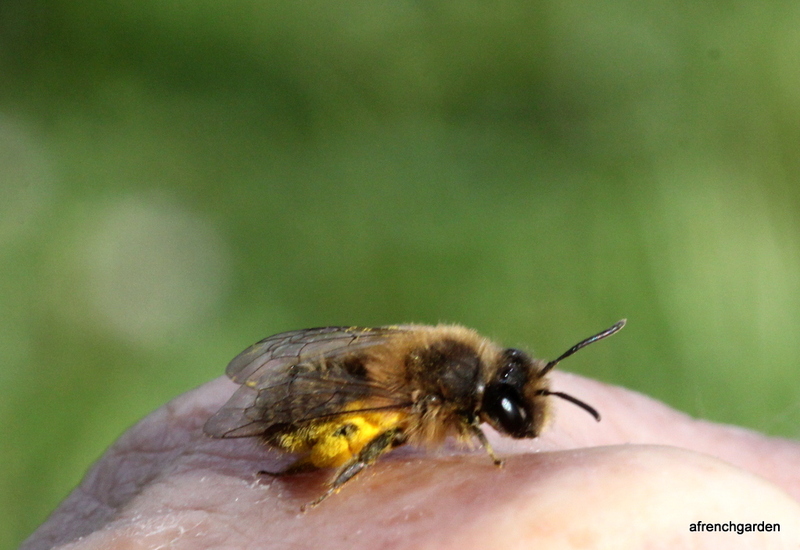 So I am satisfied that it is an Andrena. I don’t know what she has been doing as she seems to have something sticky on her foreleg. She was taking time to groom herself which gave me time to get some photographs. I didn’t see her on any flowers and I wondered if she had gathered pollen from the plum tree above us. 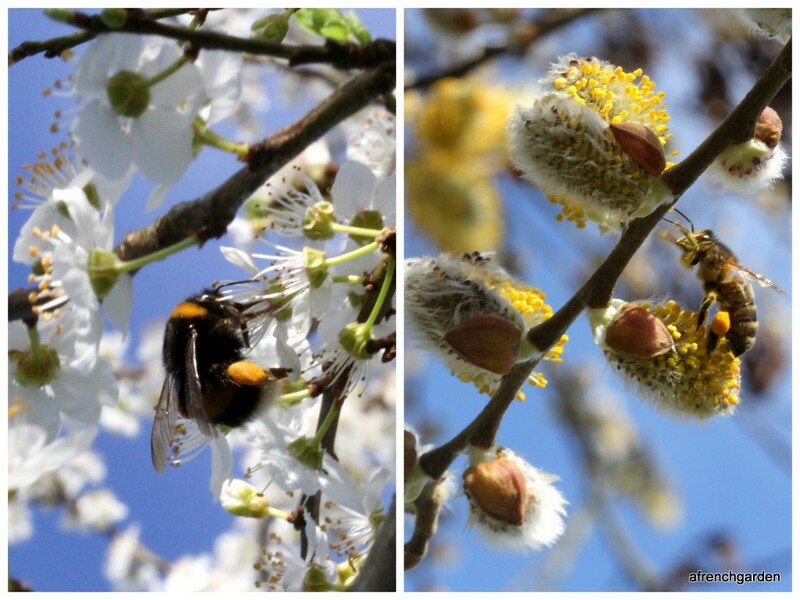 The photograph above shows a bumble bee gathering the plum pollen that seems to match but the Sallow (Salix caprea) at the bottom of the garden is also providing the same colour of pollen. So it is hard to say at the moment what she is using. I haven’t seen any parasitic bees this year but last year I saw what I think is Nomada fucata. 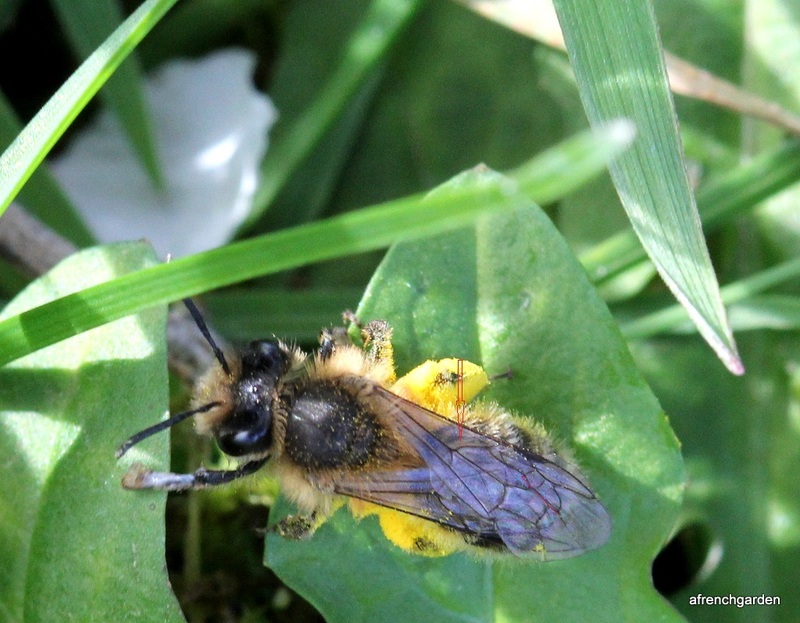 This further convinces me that my mining bees are Andrena flavipes as these are parasitised by Nomada fucata. She is a very sweet bee and hopefully I will be out there watching her in another day or two as the rain is forecast to stop and we are even promised some sunshine!